Methodist General Conference in Tampa, Fla. A UMNS photo by John C. Goodwin. Click on image to enlarge.View more photos. 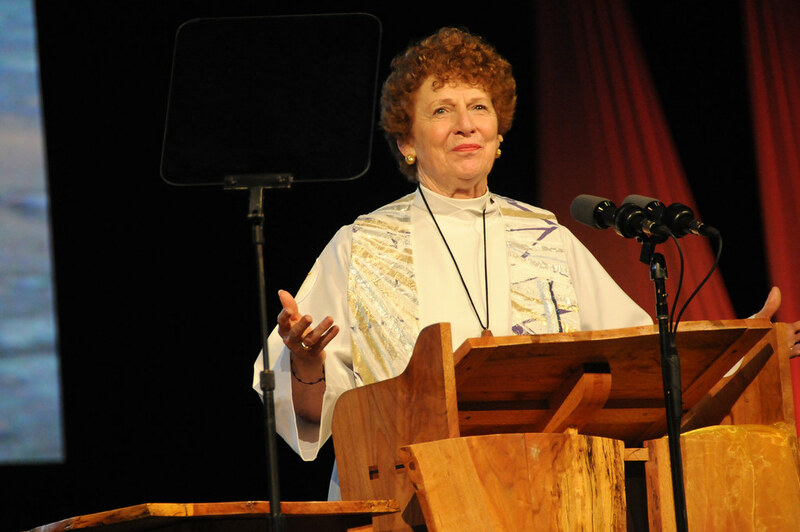 Recalling the words of Saint Francis of Assisi, "It is in dying that we are born again into eternal life," Bishop Jane Allen Middleton of the Harrisburg Episcopal Area opened her sermon for evening worship May 2 at the 2012 General Conference. The service honored the lives of bishops, spouses, and general conference delegates who had crossed into life eternal. "They have left a legacy of hope to us," Middleton said. "This wonderful inheritance calls us to leave a legacy of hope to others." Middleton called on her audience to celebrate the lives of those saints who have gone before. Drawing on poet Henry Van Dyke's image of death and immortality in "The Ship," Middleton reminded her listeners, "We do not see those ships sail away," she said. "Because of the legacy they leave, we see the ships coming in full sail, carried on the wind of the spirit." Recalling the biblical story of the three women who go to Jesus' tomb and find it empty, Middleton pointed to the resurrection as hope even in the midst of death. "We proclaim the reality that because of Jesus' resurrection, the empty tomb is a symbol of hope," said Middleton. Because of the resurrection, the possibility of new life exists even in the most desperate of circumstances. Middleton shared the story of Gary, an exuberant 29-year-old pastor, who was seriously injured while swimming off the coast of New Jersey. Left as a quadriplegic and without speech, his life was full of despair. "I visited him in a nursing home," said Middleton, "and noticed many framed paintings that I learned he painted with a brush in his mouth. 'They are Christmas presents,' he wrote on a board. 'I'm more of a minister now than I was before. You have to lose your life to find it.'" In yet another story of transformation, Middleton told a story of how a young boy's life was touched by the ministry of four teens. Last summer, dozens of teens were scattered across York, Pa., repairing homes, cleaning parks and tending community gardens. Four teens spent days reconstructing the porch at the home of Nadine and the four generations who lived with her. Four-year-old Solomon and his friend Jamal watched from the locked front screen door as the teens worked and chatted with the two of them. When it was completed, Solomon jumped up and down on the new porch and exclaimed, "When I get big, I wants to build porches 'n help peoples." "Our Christian faith provides a wonderful cycle of hope for life," Bishop Middleton said. "Jesus has left for us a legacy of possibility, of reconciliation, of new life. We are called to recommit ourselves so that we offer to the world a legacy of hope." *Wolgemuth is director of communications of the Susquehanna Annual (regional) Conference, a Pennsylvania conference of the United Methodist Church. News media contact: Maggie Hillery, (813) 574-4837 in Tampa, Fla., through May 4; after May 4: (615) 742-5470 in Nashville, Tenn., or newsdesk@umcom.org.